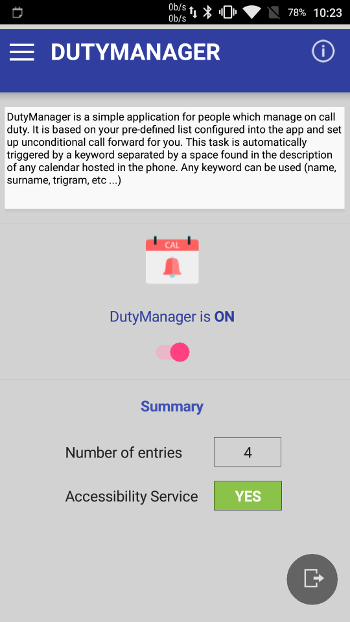 DutyManager - Manage on-call duties easily ! Maximize your business efficiency by easy on-call scheduling with DutyManager. 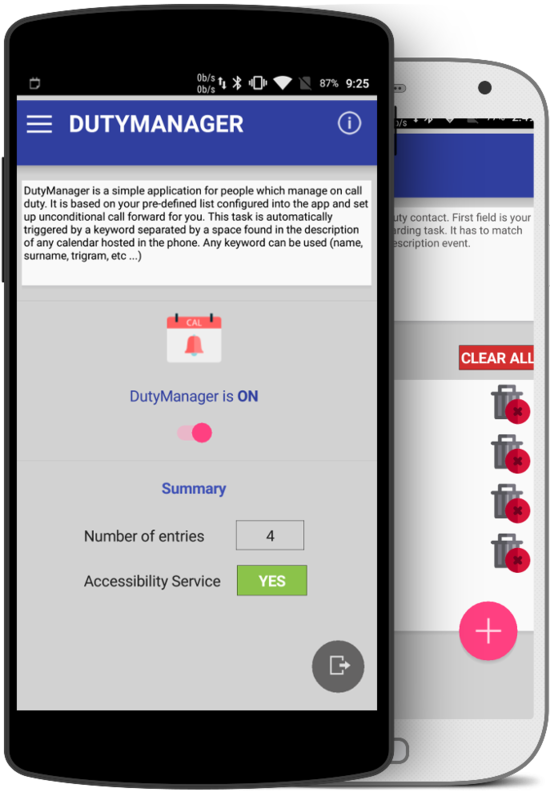 DutyManager is a simple android application for people, small and medium sized businesses who manage on-call duties with a phone. 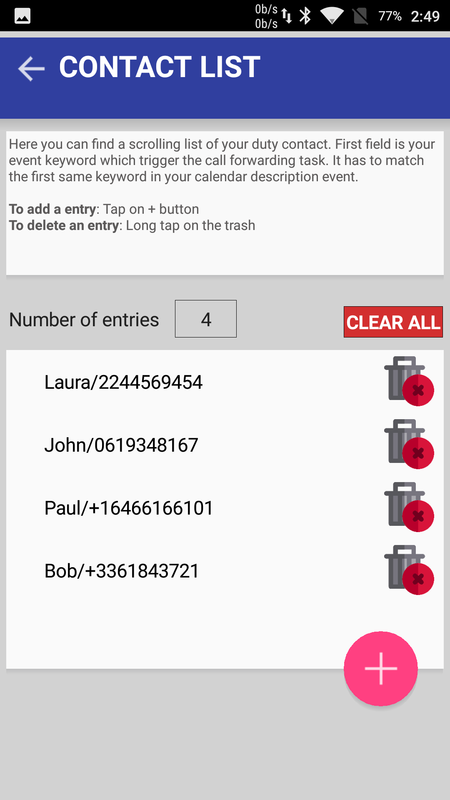 It's based on your pre-defined list configured into the app and it routes all calls and text messages (sms) automaticaly to the right contact, triggered by an event in your calendar. Call forwarding task is triggered while your defined keyword is found on your synchronized or local calendar, at the event start time. Any first keyword specified at the beginning of calendar description, delimited by a space triggers the forward task. Forget the phone and manage shifts from google calendar website (or any calendar configured and synchronized on the device). 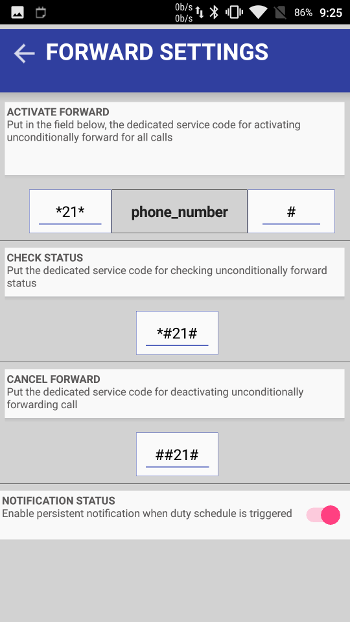 Customize short code to setup unconditional forwarding based on your mobile provider guideline. Manage your own list in an easiest way. Keyword (a name, surname, trigram, etc...) + phone number. 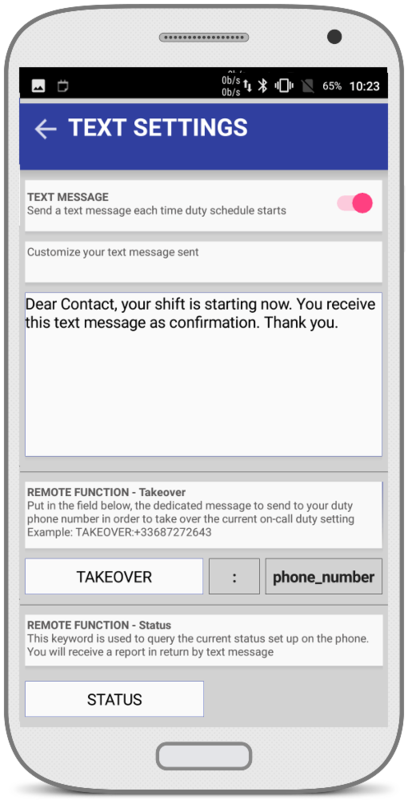 Automatically remind duty contact when their on-call shift is begin with a customizable. Receive all text messages sent to duty phone number (very useful for alarm system notification). 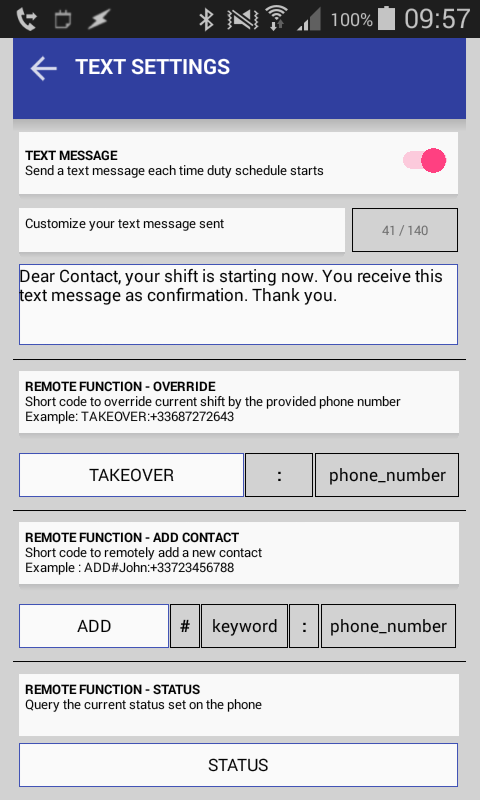 Add a new entry, override on-call shift ("takeover"" on a scheduled contact) or check the status at any time, through text message. If your device is rooted (this app doesn't root your phone at all), close popup windows automaticaly and reboot the phone remotely are available. This video describes the process of setting up DutyManager after installing it, and show you how it works for real. Note: For full screen video, please open it on Youtube website. 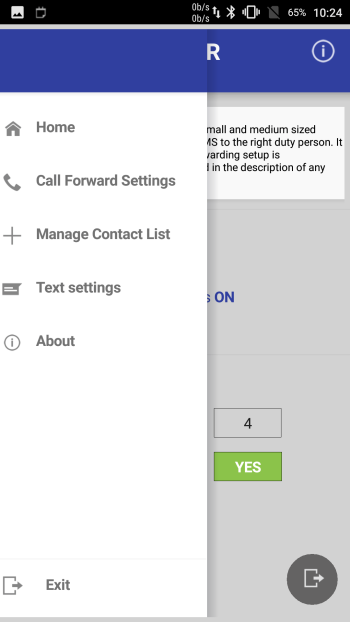 2019-03-20: Due to Google policies, DutyManager has been removed from Play Store as "Call Log or SMS data" permissions were used to divert calls. Shame !